There are two panels that display. On the right hand side is a list of user profiles. These are access templates for different database file sets. 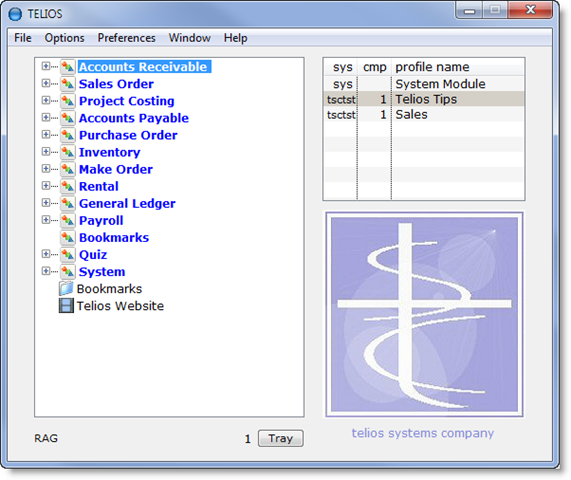 A user profile is a custom list of programs that the user can execute – along with permissions (e.g. add, edit, delete, export, print, etc.). User profiles are assigned in the User Maintenance program, edited in the User profile program. You can have as many profiles as you want.The profiles assigned to the current user are listed on the right panel. Items with a + sign are headings which group similar programs. To expand these items, either double-left-click, or when the item is highlighted, press the RIGHT arrow, (or the LEFT arrow to collapse the item). To execute a program, double-left-click on its title or press ENTER when it is highlighted. To navigate through the menu, you can use the mouse wheel. You can also press the first character of a menu item. The highlight will move to the first item that matches the character that you enter. For example, if you press the letter “R” on the above menu, the highlight will move to “Rental” heading. Press “R” again and the highlight will move to the “Reports” heading under Rental.